Buy X and Get Y is the most popular BOGO deal in the eCommerce world. Here are the common discount scenarios used. The quantities used here are just examples. You can adopt this example to your requirements. Buy 4, get the 5th free - usually the cheapest. 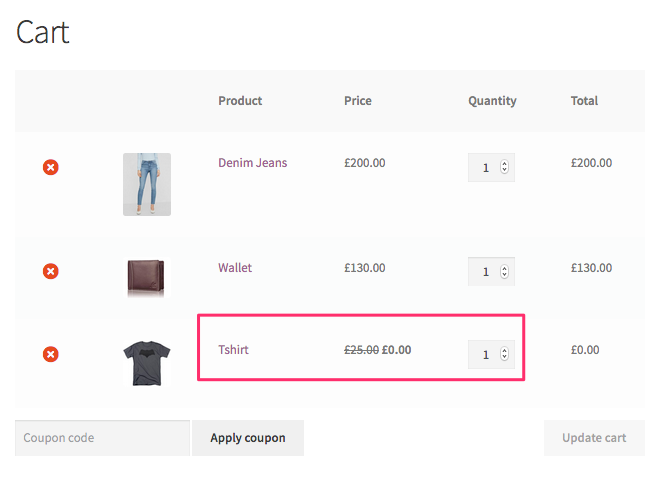 In the above cases, all you need to do is, just adjust the "Min" and "Max" quantity fields in the discount tab. The purpose of the Min - Max fields is to provide you the flexibility. In this example, we used Specific Categories. 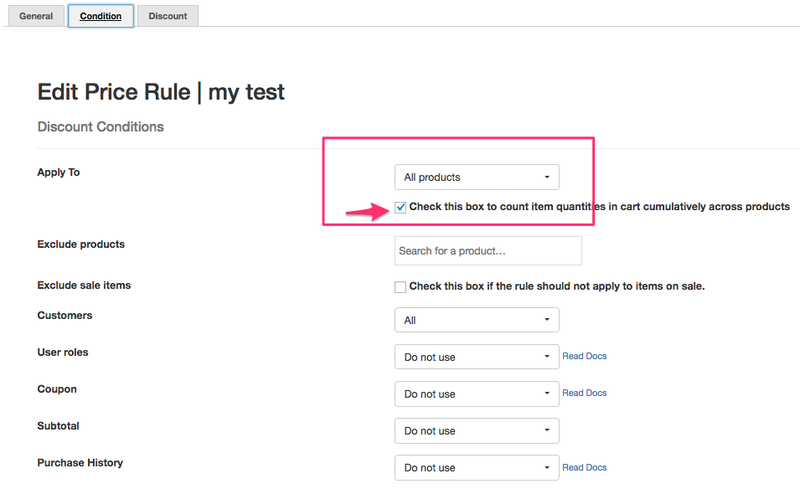 That is the rule applies to products from all the selected categories. Make sure you check the box to count quantities cumulatively. If you need this to apply for a specific products only, you can choose Specific products as well. Make sure to choose the Dynamic Item count. 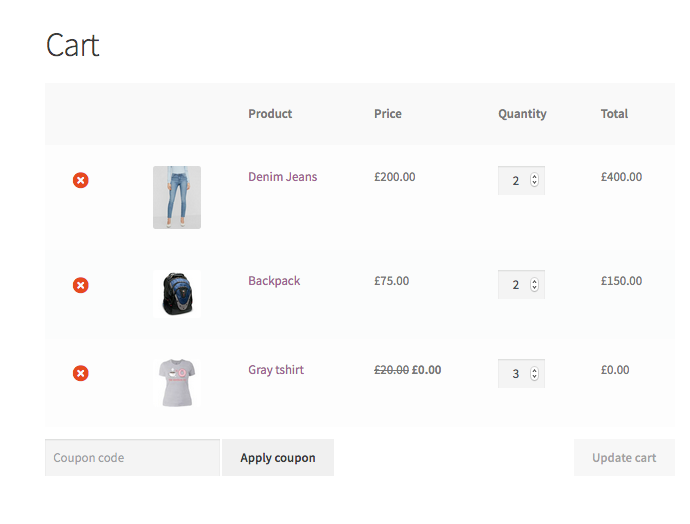 This will ensure that it will find and apply the discount to cheapest items automatically hierarchically. 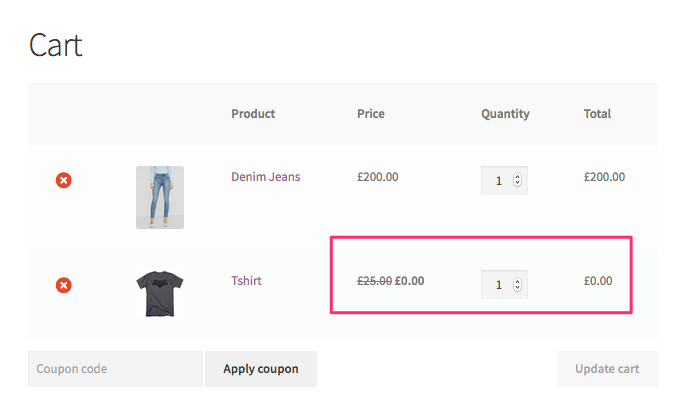 You can configure more ranges if you think your customers might purchase more quantities in a cart. For instance, you may want to provide: Buy 5, get 1 cheapest among them free. 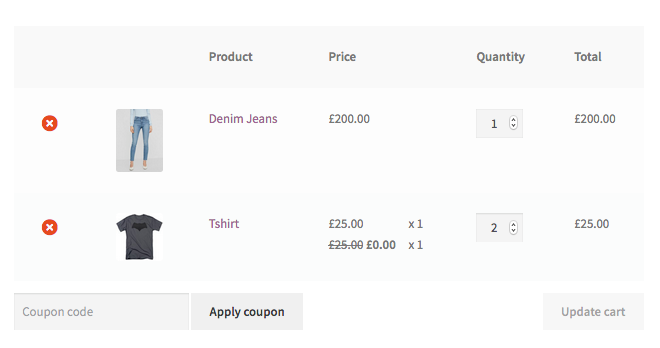 What if customer adds 7 quantities of three different products to cart? 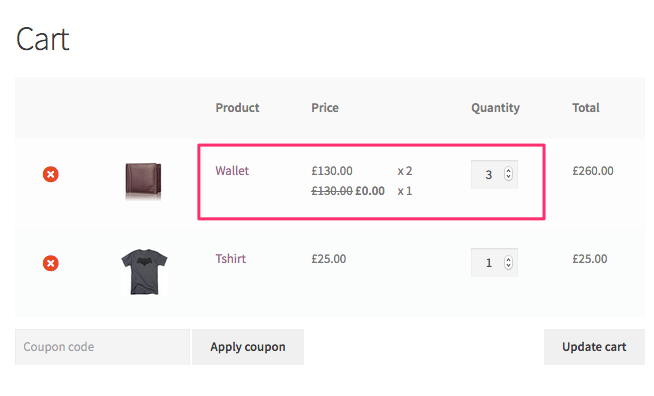 What if customer buy 7 quantities and there only 2 Grey shirts are in the cart ? The 2 Grey shirts will be discounted. And the plugin will find the second cheapest item, which is Backpack. So 1 quantity of the Backpack is offered free. 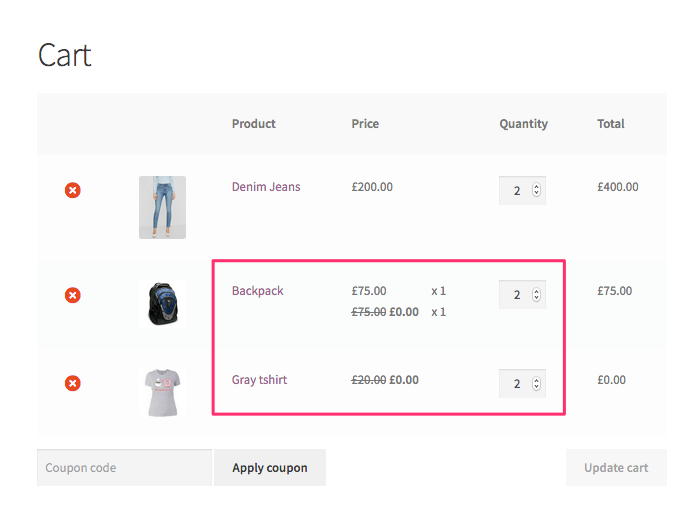 What if customer added 1 high value item and 2 cheapest items to cart ? The customer will get ONE Tshirt free. He will be charged for the second quantity. Because he is eligible for only 1 free quantity here. NOTE: You can add as many ranges as you like. 2. How to provide Buy 2 and get the third cheapest product free ? In other words, this means: Buy 3 products and get 1 cheapest among them free. So just alter the Min and Maximum quantity range. 3. 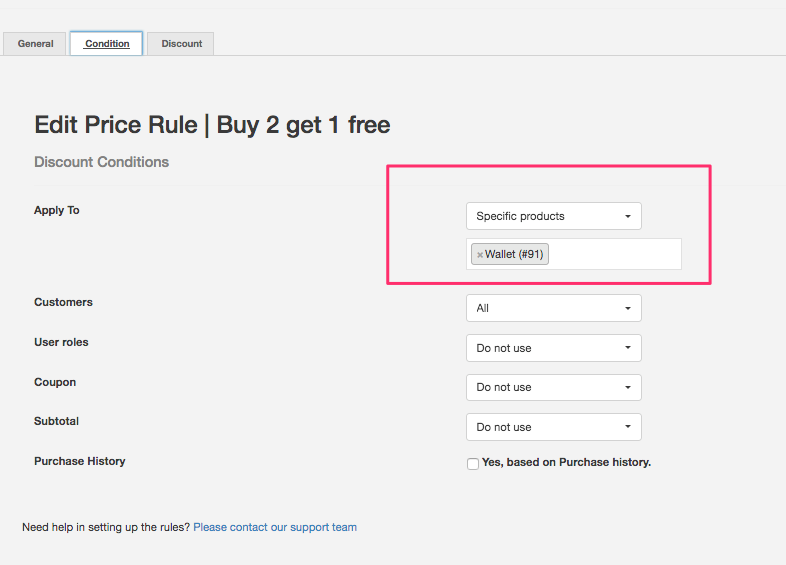 How to provide "Buy 2 Product A and get third quantity free"
That is, the BOGO applies only for purchasing specific product. 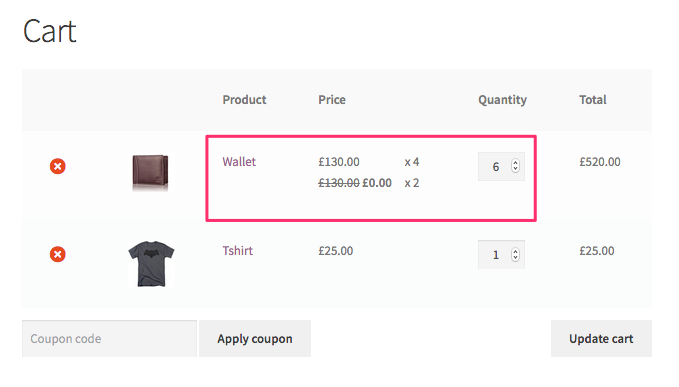 example: Buy 2 quantity of Wallet and get the third quantity free. Note: You need to choose the apply for as: More than one cheapest from selected. And choose the same product as in the conditions tab. Buy 2 quantities from Soap category, get 1 cheapest product from the same Soap category. Choose the Adjustment type as: BOGO Product Discount -> Cheapest in cart - Selected Categories. Now customer will get the discounted product from the same category. In the conditions tab, make sure you choose the specific category that sets the eligibility. In the discount tab, choose the Adjustment type as: BOGO Product Discount -> Cheapest in cart - Selected Categories. In the above example, customer gets 1 product free from "shoe" category, when he purchases 1 product from "shirts" category. NOTE: The customer has to add the product from Shoe category to get the discount.